Will you be buying a Windows 8 tablet? 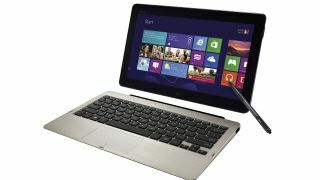 We're getting a sense of de ja vu here, but Asus has just announced the launch of a duo of 'incredible' Windows 8 tablets. They'll be going on sale on October 26, which also happens to be the Windows 8 release date. If this is ringing any bells for you it's because Asus also announced these two Windows 8 tablets at Computex back in June, but this latest release does at least furnish us with some extra details. For a start, Asus' Windows 8 tablets are to be called the Asus Vivo Tab and the Asus Vivo Tab RT. That may not impress many marketing execs as a brand name (Vivo means 'to live'), but it is at least better than Tablet 810 and Tablet 600 which is what Asus was calling them last time we spoke. Of course, being Asus products, both Vivo Tabs come with battery-packing QWERTY keyboard docks, just like the Transformer Pad range, new Transformer Books and the office-favourite Asus Coffee Mug. Even Asus' QWERTY keyboard docks come with QWERTY keyboard docks these days. The Asus Vivo Tab has an 11.6-inch Super IPS+ 1366x768 10-point multi-touch display and uses stylus tech supplied by Wacom. It weighs 675g, is 8.7mm fat and also sports an 8MP rear-firing camera with autofocus and LED flash. There's also the obligatory 2MP front-facing camera, NFC sensor and more. It's all powered by a new Intel Atom CPU, 2GB RAM and 64GB of solid state storage. Asus says this one is all about productivity, while the Vivo Tab RT is more ideally suited to "entertainment on the go" and if you look at the specs of the latter you'll see why. It looks similar but under the hood it's a different animal. It's powered by Tegra 3 innards, is slightly thinner and lighter than its bigger bro and also comes with half the storage space. We'll bring you some first impressions with these things the second Asus lets us at them, but judging by the press release's excessive use of the word 'incredible', they're almost certain to be... amazing.